Be sure to check out our page devoted to wordless picture books. As well, you will be interested in our page about anti-bullying picture books for children. The story of the lion and the mouse is an Aesop’s fable that every child ought to know well. The lion, powerful and dangerous resists an opportunity for bullying and, instead, is kind to a small mouse. Later, when the lion is trapped in a hunter’s net, the grateful mouse has an opportunity to return the favour. He chews the rope net and eventually manages to free the lion. 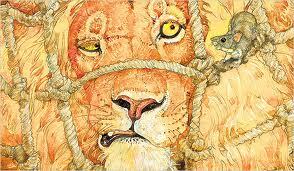 Jerry Pinkney has created a masterful, almost wordless picturebook version of The Lion and the Mouse. From cover to cover, beautiful illustrations depict the African Savanna and the animals found there while telling the story of a compassionate lion and his small friend. Winner of the 2010 Randolph Caldecott Medal and also a New York Times 2010 Best Illustrated Book and a 2010 Horn Book Awards Honor Book, The Lion and the Mouse relies upon the illustrations to tell the story. Pinkney only uses words to describe animal sounds. Highly recommended for both classroom and home libraries, The Lion and the Mouse could be used to explore many themes including anti-bullying, friendship and stereotying. The Tale of Sir Dragon: Dealing with Bullies for Kids (and Dragons) is part of the Dragon Safety Series. Other books in the series provide suggestions regarding fire safety, water safety and stranger safety. “Let’s chase him away!” he cried, raising his shield. The dragon’s friend responds by standing up for his buddy and, when that does not solve the problem, seeking help from nearby adults. The adults respond promptly and effectively: while one adult talks quietly with the bully’s victim, the other adult chats with the bully and his friends. The King asked us, “What does it mean to belong? “Have you ever felt picked on?” I asked. “Have you felt small? Endnotes for the book provide anti bulying information for children as well as ways we can all help to stop bullying. Storytime Standouts’ page about bullying and antibullying resources has additional book suggestions. Harry, Lulu and Ted are off to their warm bed, ready for a good night’s sleep. Ted and Lulu are soon quietly snoring while Harry the elephant lies awake. Perhaps looking at a book or changing position will help. Alas, no matter what Harry tries, sleep remains elusive and he soon begins to worry; wiggling and rolling about. Finally it is Ted and Lulu who help their friend to find sleep and happy dreams. Good Night, Harry is a warmly illustrated, reassuring bedtime story. Despite warnings that she must not go outside alone, young Leah leaves the safety of her far North home and sets out to explore an enormous iceberg. “Leah walked away from her house, past the church, down to the beach, and out on the ice towards the iceberg that looked like a magical island of snow.” Just as Leah begins her adventure, a small polar bear cub is drawn to the same intriguing iceberg. As the moon rises, girl and bear cub meet in the middle of the frozen bay. Meanwhile, Leah’s father and the bear cub’s mother race desperately to locate their offspring. Out on the Ice in the Middle of the Bay is filled with suspense as Leah explores the cold and dangerous world outside. It prompts the reader to consider not only the ways that Leah and the cub are alike but also how Leah’s father and the polar bear mother are similar. A lovely book for very young children, When the Earth Wakes invites readers to observe as spring arrives, the earth is awakened and a mother bear stretches with her young cub. We watch the snow melt and the two bears frolic in the sunshine and warm breeze. Before long it is summertime; butterflies, salmon, thunderstorms and starry nights change the natural landscape once again. When leaves begin to change and blueberries ripen, the two bears know it is time to prepare for winter. A lovely, gentle circular story about the changing seasons and our beautiful earth. Striking coloured pencil illustrations make When the Earth Wakes well-suited to a read aloud setting.